Camping involves a lot of wear and tear over time, as well as a lot of wet weather to contend with. Whether you’re looking to use an old tent that has worn down or ensuring that your new tent is properly conditioned, waterproofing your tent is an important step and should not be taken lightly. We aim to cover all the considerations you need to keep in mind when it comes to protecting yourself from the elements and staying dry in all conditions. Any camping trip will undoubtedly be dampened by wet gear. Furthermore, if you’re unable to keep you and your things dry, you won’t be able to enjoy yourself to the fullest. If you know how to waterproof a tent then you can avoid these issues and save a lot of money in the process. That being said, it doesn’t take much to properly waterproof your tent and a little pre-planning will go a long way to making the job much easier. The first thing you should ensure you do before you start your waterproofing process is cleaning your tent thoroughly before applying your chosen sealant. It doesn’t matter what type of sealant you use, it will inevitably be ineffective and not last very long if applied to a surface that isn’t clean and clear. In addition to cleaning your tent both inside and out prior to waterproofing, your chosen sealant should be based on what materials you are applying them to and what areas of the tent you plan to cover. We will cover your sealant options in more detail in just a little bit. Many tent materials are themselves waterproof nowadays, meaningless work in the long run, but these still have troublesome areas that will inevitably need waterproofing treatment. The main areas you want to cover are your rainfly, as well as any seams or zippers. Another good idea is to ensure that the surface you pitch your tent on is able to prevent heavy rain from creating pools or streams that will cause undue discomfort. If you want to make the most of your waterproofing, including accessories such as tent footprints or tarps are solid choices that offer complete protection from the elements. Both a footprint and a tarp can sit underneath your tent, providing extra protection from water collecting around the base of your tent. Furthermore, a tarp can be extended above your tent, allowing it to function as an additional rainfly. 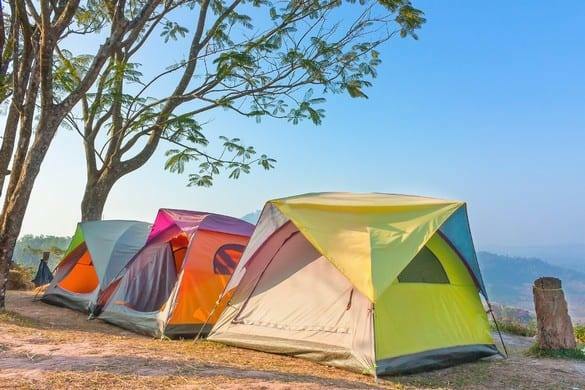 These add-ons aren’t essential, but will help protect your tent and keep your sealant from wearing away quite so quickly, letting you stretch your investment and stay thoroughly protected. While most aerosol sealants will work well with just about any material, it’s always worth double-checking and ensuring that your sealant is best-suited to your given tent material. Testing your tent is also important when it comes to determining if you need to reseal it to begin with, with the easiest method being to fill a bathtub with water before submerging your tent in it. If air bubbles escape through the material, that’s a good sign your sealant needs replacing. Your rainfly is your first line of protection against leaks and you should pay more attention to it than any other area. If your rainfly is faulty then it really doesn’t matter how well everything else is waterproofed, it’s just a matter of time before the drips start coming in. The seams are tricky and take more time to dry, as they require liquid sealant and attention to detail, but they are right below the rainfly in importance with regard to leaks and are absolutely worth maintaining. If your seams fall apart, after all, your tent will end up quite open and breezy. Not many people pay attention to their zippers the way they should, but we think they’re exceptionally important to keep in mind. They are much like your seams and taking proper care of them is crucial to maintaining a tent that is long-lasting and durable. This is the easiest sealant to apply, as you can just depress the nozzle and spray. A good rule of thumb is to coat every single surface of your tent, both inside and out, before letting your aerosol sealant dry. This is your first step and will give your tent an incredible coat that will cover pretty much everything you need it to. Cover the walls and floor, making sure to flip the tent over and cover the bottom once you’ve coated the rest of it. The tent’s rainfly should also be coated in this manner. Applying liquid sealant to the seams can be done with a brush and you should make sure they’re coated well. Many liquid sealants require a longer drying time than aerosols, usually needing at least a full 24 hours for a solid seal. Tape is used to patch up tears and punctures that will undoubtedly let the water in. They can also be used to help seal your seams, but the liquid sealant works just as well. As you can see, there’s really not much that goes into waterproofing a tent, although it can be a daunting proposition for the uninitiated. 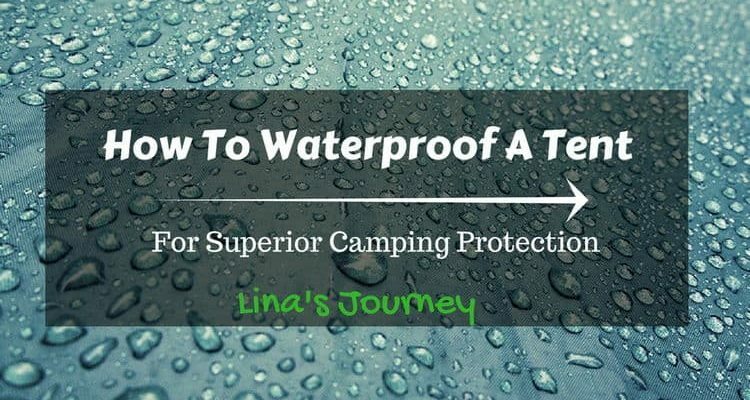 When all’s said and done, waterproofing your tent is all about properly maintaining your gear with the goal of increasing its longevity and decreasing any chance of discomfort for you. We recommend properly inspecting all your gear before you head out on each trip, just in case. It’s much easier to deal with these things when you’re not on the trail or likewise in the middle of nowhere. Regularly testing your tent at least twice a year will ensure that it is in good working order and highlight any areas you need to address, avoiding the hassle of belatedly noticing a leak in the middle of a downpour.